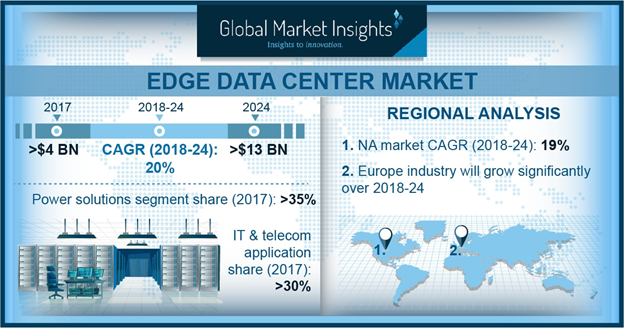 Edge Data Center Market size is set to exceed USD 13 billion by 2024; according to a new research report by Global Market Insights, Inc. Growing demand for edge and cloud computing technology is driving the edge data center market. These technologies allow organizations to set up their infrastructure facilities close to the source of data generation. It offers complete control over the data processing and storage at the edge of a network rather establishing it in a centralized warehouse. Several advantages of these technologies in the industrial sector include reduced network traffic, real-time data analysis, low operating costs, and improved application performance. The organizations are witnessing a rapid increase in the data processing frequency and rate, enhancing the business operations and fueling the market growth. Major players operating in the market are Cisco Systems, Inc., Edgeconnex, Rittal, Elliptical Mobile Solutions, Dell, Inc., Huawei Technologies Co., Ltd., Zellabox, Anixter, VXchnge, Anixter International, Dell, Inc., Wave-2-Wave Solution Corporation, Schneider Electric, Panduit Corp, Silicon Graphics, Inc., 365 Data Centers, Compass Data Centers, and Bytegrid, among others. The companies in edge data center market are increasingly targeting their offerings in small and medium enterprises. These businesses are adopting cloud technologies to store and process large volumes of data. Moreover, the companies are adopting strategies, such as new product development and product differentiation, to tackle the competitive environment in the market. For instance, in April 2018, Nokia launched AirFrame, which is an open edge cloud infrastructure developed for optimizing the performance & operator costs as the company is improvising its networks to prepare for the 5G connectivity.